You can love or hate front license plates, but they’re a requirement in 31 states including Texas. However, that could change if a proposed bill by Texas Rep. Ken King passes, according to The Drive, which discovered the legislation. King, who’s been spotted in a Chevrolet Corvette, introduced Texas House Bill 673 that would eliminate the requirement for a vehicle to display a front-mounted license plate. Except the front license plate exemption would only pertain to luxury passenger vehicles, which the amended bill describes as a vehicle “that has a manufacturer’s suggested retail price of at least $60,000 for a baseline model.” That means people who own vehicles with a base price under $60,000—like a bare-bones Chevrolet Corvette that has a starting price of $55,900—still have to pay for and display the front license plate. While the people are paying more for cars than ever before, the average price for a new car transaction in the U.S. was $37,149 and $34,996 for a new sports car, according to The Drive, which cited data from Kelly Blue Book. That’s well under the $60,000 threshold King is proposing. 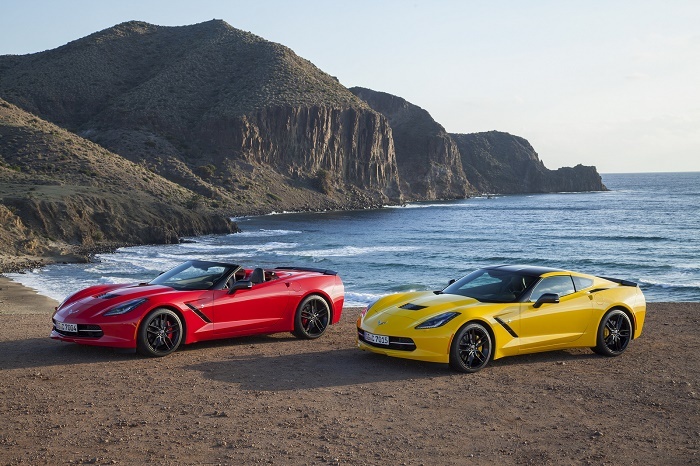 King is correct, though, that cars like the Corvette do not come with a front license plate bracket and often owners aren’t happy drilling holes into the bumper of their new vehicle. They’re aesthetically unpleasant and can ruin the look of a car. But King’s bill misses the point. If he wants to do away with front license plates for vehicles, he should revise his proposal to eliminate them for all vehicles, not just once with a high price tag. The benefit of saving money on a front license plate should be available to everyone, like those who own a Chevrolet Camaro. I’d lived in Florida without front license plates for 29 years and when I visit my family in NY with front plates, it’s just ugly with bugs spattered all over them. As I see it they serve no function other than making it easier for meter maids to write parking tickets. Almost all states the annual tag is stuck on the rear plate. When the state law makers learn how much it will save in stamping just one, not two plates, it would be a no brainer to change the law. Abolishing the front plate law makes sense… Period. Abolishing it only for those who spent at least the $60,000 threshold seems elitist. My sentiment EXACTLY. Here in Fl. there is no front plate regardless of cost and on my vette it’s much better looking. Front plates are ugly besides non-aerodynamic and only there for law enforcement so they can nail you with a ticket using laser and a reflective surface since most cars are not these days. Want to think about something reasonable? Why not do what the U.K. does and issue a plate # for life with the vehicle! Why isn’t it done here? Because the DMV makes a $hit load of $$ on issuing new plates. New car gets a new plate and goes into a NATIONAL database which might also help with theft/recovery. Oh, BTW, plate old and ugly? Simply pay for an exact replacement when putting it on a nice vehicle, IF you choose. Damaged =’s mandatory replacement. It really opened my eyes and made such sense to me. In fact, I wonder why license plates aren’t required on the sides of vehicles as well. And the roof too! Just think about how much crime would be reduced. Maybe we should have laws that say license plates have to be tattooed on our foreheads. Great crime fighting tool, to be sure. I agree that it would definitely would help fight crime if the plates were on all sides of the vehicle including the top for helicopter police. But your tatoo statement gave me an idea. Why not permanently tatoo the plate number on all sides of the vehicle without using any plates at all? So…make everyone’s car look like $#i+ because doing so makes it easier to catch a criminal? I don’t think so. How about front license plates ONLY for convicted felons – using your theory, the benefits are limited to identifying criminals, and what better way to id criminals?? JGinNJ – by that logic, why not require “side plates”, or make every car have a reg number on the doors and hood? The incidents you site are so rare and random that the cost of issuing multiple plates in terms of global warming as a result of manufacturing, storage and shipping of front plates, increased fuel consumption resulting from aerodynamic issues with plates, and wasted resources far outweigh the cost of the issues you bring up. There’s a reason 40% of the united states don’t require front plates — they’re useless and wasteful, contribute to global warming and foreign oil dependence. Our state spends over $2m issuing front plates. Money that could easily go to school breakfast programs or bridge repair. Totally wasted. A requirement to have a license plate underneath a vehicle as well, say attached to the oil pan, would be useful too. Just think of how many people who get run over and survive will be able to identify who it was that ran them down and then took off. You think school breakfast programs and bridge repair are more important than that? Think of the justice we can bring to countless squirrels. We should have one inside the trunk, as well…that way, should you be fortunate enough to survive an abduction, you can write down the plate number while you are being hauled around in the trunk to ensure the abductor(s) is/are caught later. Great idea. It is unfortunate that people are not focusing on the main reasons for the existence of cars.They are essential crime fighting tools and devices to carry license plates. Why not just have a option to have a window decal displayed at top center of windshield with tag number? Makes it easier to see, especially in lowered vehicles such as “$60,000” sportscars? Easier to see and appeases both sides of issue. You are correct, but the issue here is very simplistic – write the the way laws are intended to be written…..to apply to everyone! This “rep” needs to realize and get rid of the selfishness within himself, which is a different matter but just as easy to rectify. I agree, there is foolishness in his argument, common sense is absent, however even the fact that some states differ in this rule shows that the whole front tag issue wont make a difference in crime fighting. With cameras everywhere and a video recorder in everyone’s pocket, you wont get far. Front tags is 90s tech, your phone is a mobile tracking device too so come on. I’ve lived in Arkansas for most of my life, I’m 75 years old. As far back as I can remember, Arkansas has never had a front license plate. Years ago Oklahoma made pickups go through the truck scales. We pulled on the scale and the official mentioned that the pickup didn’t have front plate, dad said “I don’t need one”. Now Oklahoma has done away with front plats. No need to have them. The reason for the front plate is probable cause no more no less. I have friends who are cops and most could care less about the plates but most say that there are enough departments that use it as probable cause to pull some one over and check them out. Based on the number of outstanding warrants drugs found on live PD for plate or light violations I see why many require it. I hate the front plate and if they are going to remove it they need to do so for all cars not just the expensive cars. I am sure some 1976 Vette owners want to lose the plate too. You know if people stopped using drugs and started to obey the law the plates would go away much easier. If you want someone to blame find the root cause. I rigged up a retractable plate for my show car to get by the tough towns that enforce it. “You know if people stopped using drugs and started to obey the law the plates would go away much easier. If you want someone to blame find the root cause. Lets get rid of the metal plates altogether and use vinyl lettering, the same as used for boat registrations, front and back. This is so American. Rich people don’t have to follow the law while the schmucks have too. No wonder the bottom 50% are so angry. I’m a retired Texas police officer and I think it is stupid to need 2 license plates. It would save the state money on production cost having to produce only 1 per vehicle and it allows those who have sports cars that a front plate is unsightly (Corvettes and others) and allows those who want to put a vanity plate on the front the option. The state if Arkansas has never had a front license plate, at least in the 75 years I’ve lived here.